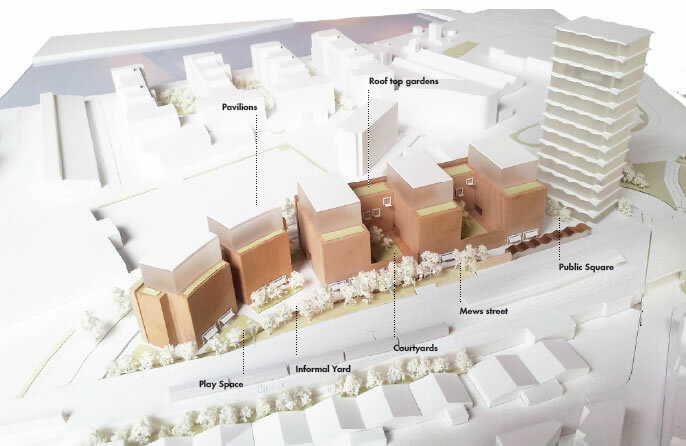 Several building, including a 25 storey tower, are proposed at the current site of Homebase, Swanden Way, near Wandsworth bridge roundabout. Ah ah ah! As for recent applications in Lombard Road or York Road, developers are now ignoring completely that policy and submit 14, 17, 21,25, 28 or 30 storeys without batting an eye. The Proposal as received more than 40 objections so far and no support. Beside the massing and the size of the development, the most frequent critic is on the pressure created on Wandsworth Town Railway Station that has already major difficulties to respond to the pressure of commuters at peak hours. As the planning officers are currently recommending for approval any major scheme in the area, our only hope of recovering some sense of reality will probably rely on the Councillors members of the Planning Application Committee if such scheme comes before them. This entry was posted in Clapham Junction Action Group, Wandsworth Events, Wandsworth Town and tagged Clapham Junction, events by Cyril Richert. Bookmark the permalink. Wandsworth is creating a too much high rise and not building new parks and recreation areas for the new populations so problems will occur. The building in Wandsworth is already too dense. There are not enough facilities : we need schools and hospitals and parks. We do not need more flats. More flats will have a negative impact on traffic resources car queues and crowds. This will be more drain on resources and utilities an not serve the existing residents in low quality social housing. with a big garden/park area or another shop or business. It could provide some low rise social housing with a garden area and keep all the beautiful trees. The more buiding the more the built environment is getting hotter and hotter and Wandsworth is a black spot for car pollution from fumes in the summer especially. More people bring more cars and and more fumes. More schools are desperately needed. More hospitals and public services to serve the people who live here already are needed. We do not need any more people at all in Wansworth. It is not common sense to overbuild its just greed to make money. Build and develop out of London sites. Renovate the social housing to a decent standard to keep the residents safe. Don’t build more flats for the rich on the Homebase site in Wandsworth we don’t need more people. We need to reduce pressure on schools jobs and hospitals. Develop sites out of London. This site allows fresh air to flow : this is a perfect site for a Youth club, a sports park on this site for the youth. Support the Wandsworth youth so we don’t get more rapes crime and murders This is a perfect site for a boxing club or a Sports Centre or youth provision.